Catena Zapata – the Young Pretender? The wine world loves those stories of the experts being fooled” by some upstart New World wine in a blind tasting. It happened most famously in 1976, when UK expert Steven Spurrier organised a tasting in Paris. Top Californian wines were pitted against the best of France: Cabernets vs. Claret and Chardonnay vs. white Burgundy. The results sent reverberations around the world of wine: Stag’s Leap Wine Cellars 1973 beat Mouton, Latour and the rest of the Bordeaux pack, and Chateau Montelena’s 1973 Chardonnay beat the top Grands Crus of Burgundy. 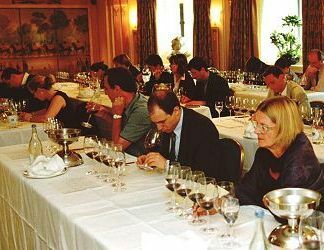 Another momentous occasion was in 1985, when leading merchants Avery’s of Bristol organised a huge tasting of the world’s best dessert wines. Included was a brand new wine from Australia, the 1982 vintage of de Bortoli’s ‘Noble One’. Noble One achieved instant legendary status by beating all-comers, including Château d’Yquem. Could the 10th of September 2001 go down in the wine annals as another of these moments? Nicolás Catena is without a doubt the fastest rising star of Argentina’s fine wine scene. He has just released a new wine to sit at a level above his ‘Catena Alta’ bottlings of Malbec, Cabernet Sauvignon, Merlot and Chardonnay. These wines have provided me with fabulous drinking pleasure and have acquitted themselves well in the company of fine wines from around the globe. For the launch of his new wine, Catena decided to enter the lion’s den by inviting the world’s top experts to taste the wine, named ‘Catena Zapata’, against the best from Bordeaux and California.The 1997 vintage is the first release of Zapata, a Bordeaux-like blend of 95% Cabernet Sauvignon and 5% Malbec. It will be produced only in the best vintages and is made in a brand new winery. The winery, built in the Mayan style, is a statement of pride in the family’s roots says Nicolás Catena. To launch this new wine, Catena Zapata staged a series of blind tasting showdowns between their wine and the best competitors the world of wine had to offer from the same vintage: similarly styled wines from Châteaux Latour and Haut-Brion in Bordeaux, and Californian superstars Caymus Special Selection and Opus One (itself made in partnership with Mouton-Rothschild). Tasters for the London event consisted of what UK importers of Catena wines, Bibendum, described as ‘Thirty key opinion formers from the UK’, mostly wine buyers and wine writers including Jancis Robinson, Anthony Hanson and Oz Clarke.The tasters were asked to place the wines in order of preference. Much to Catena’s delight, the Zapata was ranked first. 1997 was only an average to good year in Bordeaux, but the wines are drinking well. It was a very fine vintage for Californian reds, so the result achieved by Zapata is impressive. 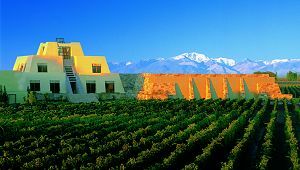 It was agreed that while being stylistically different, each of the wines measured up to each other in terms of quality, but the preference went to the Argentinian newcomer. Zapata has already caught the attention of Robert Parker, who awarded it 95 points out of 100 and said: ‘this huge, full bodied wine is surpassingly well balanced and symmetrical for its size. It should drink well for two decades’. Until I have the chance to taste the wine for myself I cannot say whether these results are a freak of coincidence, or prove that Catena’s new baby is indeed a wine of truly world class quality. But such consistency in blind-tastings by so many educated palates certainly suggests this new wine is something special – and whets one’s appetite to try it.